Posted: Tuesday, May 28, 2013 11:55 pm | Updated: 8:11 am, Thu May 30, 2013. It’s 6 p.m. on a busy weeknight. The family is complaining of hunger pangs. The fridge is full of leftovers that have seen better days. What do you do? Maryville, Mo., author Amy Houts has a meal plan and recipe book for busy, budget-strapped families looking for variety in their weekly dinners. “I’m not the person that loves to be in the kitchen all day. I like to make good food as quickly and efficiently as I can, and so I wanted to share my idea for doing that with other people,” Mrs. Houts says. Her new book is called “Mealtime Magic: Delicious Dinners in Half the Time.” Mrs. Houts developed recipes around the concept of intentionally using leftovers in new ways. “This book is based on the way that I’ve cooked for a long time, which is that I cook more meat than I need for that night and then I use that meat, or the sauce or the broth or something, in at least one other meal. ... Once you have part of your meal cooked, all you need is to add to it” she says. Most of the entries in “Mealtime Magic” center around three-day plans featuring a specific meat item like chicken breasts or ground beef. The first night’s meal requires preparing that meat in bulk, then reserving a portion of it to use for nights two and three. “I tried to make each recipe in the three-day plan different so that you wouldn’t be having all Italian or all Mexican or all Asian,” she says. For instance, a meal plan might include Asian Pepper Steak the first night, Spicy Steak and Eggs the second night and Philly Cheesesteak Sandwiches the third night. “Mealtime Magic” also includes fish and meatless meal plans. All recipes use basic ingredients that are already in your pantry or can be found easily in the grocery store. It’s best to make a grocery list ahead of time based on recipe ingredients you want to try each week. Here is a recipe utilizing homemade meatballs, which then contribute to two other meals. Mix ground beef, breadcrumbs, Parmesan cheese, eggs, salt, pepper, onion and water in a large bowl. Roll into small balls, 1/2 to 1 inch. Heat oil in a large skillet over medium heat. Cook meatballs in batches; do not crowd pan. Brown on all sides, about 10 minutes total. Add more oil if needed. Remove to a paper towel-lined plate to drain. BEFORE SERVING: Reserve 2/3 of the meatballs from Meatball Heroes for Easy Lasagna and Meatball Stew. Those recipes can be found at www.houtsandhome.com/1/archives/03-2013/1.html. Besides finding a simpler way to prepare dinners, Mrs. Houts says she wants her new book to encourage families to eat healthier at home and avoid creating food waste. “I did some research ... and found out families usually throw away about 20 pounds of food per month. That costs about $500 a year,” she says. She hopes reusing items people already have in their kitchen will help eliminate this waste. The book itself is easy to follow, with detailed instructions, easy variation options, an extensive index, a spiral binding that lies flat on the counter and coated pages that make it easy to wipe of splatters. Most of the recipes feed four people, though the amounts can be doubled or cut down depending on need. Mrs. Houts already is an accomplished author, with more than 40 children’s books, cookbooks and other materials in publication. However, “Mealtime Magic” is the first book she’s produced out of her own publishing company, Houts and Home Publications. She eventually would like to start publishing other writers’ content. She says each day is a learning process. Find her book on her website, www.houtsandhome.com, or Amazon.com. It’s also for sale at the Maryville Hy-Vee. Brooke VanCleave can be reached at brooke.vancleave@newspressnow.com. Follow her on Twitter: @SJNPVanCleave. © 2013 St. Joseph News-Press and FOX 26 KNPN. All rights reserved. This material may not be published, broadcast, rewritten or redistributed. 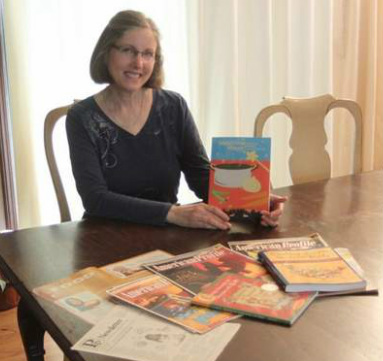 Amy Houts sits before a display of her cookbooks and magazines featuring her cooking articles. 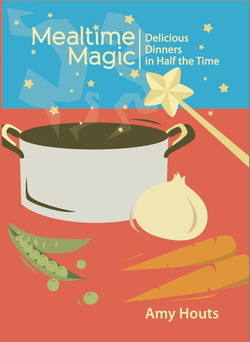 Local author Amy Houts has ventured into a new world as she recently self-published her newest book, "Mealtime Magic: Delicious Dinners in Half the Time." The cookbook highlights a plan that not only simplifies cooking daily meals, Houts says it saves time and money -- something many Americans don't have much of these days. Houts, already an award-winning author and freelance writer, said that the idea has always been with her. "I've been cooking this way for a long time," Houts said. "But I was kind of getting in a rut. I just wanted to figure out different meals to make it more interesting." Her love for cooking began at a young age and inspired her to attend the Culinary Institue of America. When she decided that she did not want to be a professional chef, she realized that she could share her passion by writing about it. The cooking strategy, which Houts developed over the years, involves intentionally planning meals with leftovers. Those leftovers are used the next two days to make completely different meals. For instance, by cooking chicken breasts, you can have chicken enchiladas one night, chicken noodle soup the next, and chicken quesadillas the third. The book includes ideas for side dishes, which are also available on Houts’ website, www.houtsandhome.com. So in essence, the plan saves money by creating less food waste, which Houts says American households throw away an average of 240 pounds per year, an estimated $500. According to Houts, the average American homemaker spends 175 hours in the kitchen per month, and she says her plan saves some of that time because at least some parts of each meal will already be prepared. This will be the 40th book that Houts has had authored. Her works include books for children, some of which contain recipes and tips for getting children involved in the cooking process. But this is the first book she has written that is self-published through her new company, Houts and Home Publishing, LLC. She said that the reason for going solo was to have more creative control. Houts lives just east of Maryville with her husband, Steve. Their two daughters, Emily Bush and Sarah Dettmer, are both grown and out of the house, but Houts still uses the meal plan. She thinks that this style of cooking has many advantages, including nutrition. The book does include some meatless meals, and has an extensive index for those who want to change things up a bit by mixing up some of the meals in the plan. There is even a section in each chapter for the reader to create their own three-day plans.Guidelines for food safety and preservation are included, since some foods don’t keep as long as others. Synopsis: With Amy Houts's "Mealtime Magic: Delicious Dinners in Half the Time", the family cook can save $500 a year in their grocery bills while spending fewer hours in the kitchen. Over 200 pages of recipes with clear, detailed directions will enable even the most novice kitchen chef to provide delicious, home-cooked meals quickly and efficiently. Amy's method (where one dinner becomes the basis of two additional meals) is practical and doable. Each meal is completely different, so different that no one will guess they are eating leftovers. And with little food waste, food budget money is saved.. Multicultural recipes in "Mealtime Magic" represent the melting pot of the USA. Recipes use ordinary ingredients available at any local grocery store. A semi-concealed spiral binding allows for easy recognition on the bookshelf and easy reading while cooking. The Baby-Kid Expo, St. Charles, Missouri, April 13, 2013. The mission of the Baby and Kid Expo is to provide the best opportunity for businesses to showcase their products and services in a fun, exciting, family-focused venue while supporting those in need in our community. Baby Kid Expo, LLC purchased the Fabulous Baby and Kids Expo in early 2008. The Expo started in the St. Charles, MO area in 2007 to bring information on children’s health, activities, schools, products, and services together all under one roof! The event keeps growing every year with more exhibitors, performers and FUN! We will also be expanding and offering more events in other geographic areas in the future. We are excited about partnering with businesses in the area in order to educate families in the St. Louis market and beyond. Please contact us anytime at 1-866-654-EXPO or info@babykidexpo.com. We’d love to hear from you!